Today Sidney, Carrie and the twins were flying up to Halifax so they could get settled and ready for the big day. The rehearsal dinner was that night and then Sidney and Carrie had their bachelor and bachelorette parties too. They got to the house and luckily Sid's parents and sister were already there. "Hey guys how was your flight?" asked Troy as he took their suitcases and set them to the side. "It was fine and we were lucky the twins slept the whole way. They are just now ready to cause havoc" Sidney said as he set down Aaron on the floor and he started crawling all around. Carrie came in behind Sidney with Ava in her arms. Ava started wiggling because she saw Aaron on the floor so Carrie put her down and Ava crawled off after Aaron. "Wow they really are getting big, Carrie" Trina said as they went and followed after the twins. "Yeah they are and they are pulling themselves up on things too. I know that Ava is getting ready to start walking at any time because she loves when Sidney takes her arms and helps her walk and she usually lets one of his hands go and tries but usually ends up on her bottom. But its just so cute" Carrie said smiling. Sidney and his dad followed into the den where everyone was watching the twins moving everywhere. Sure enough Ava pulled herself up and was holding onto the couch and then reaching for Sidney to help her walk. So Sidney walked over to Ava and they showed off her walking. This time she actually let go of both of Sidney's hands and took a few steps before falling down. "Oh my god. Ava you are walking!" Carrie exclaimed happily. She grabbed her camera and Sidney pick her up again and Ava took a few more steps as Carrie was filming Ava walking for the first time. "Did you get that?" asked Sidney as he walked over to Carrie and put his arm around her waist. "Yeah I did. Here you can look" Carrie said as she showed Sid her camera. "I can't believe it Ava you are becoming a big girl now" Sidney said smiling at Ava, who was looking at all of them with her cute little smile. Carrie picked Ava up and hugged her baby girl and kissed her on the cheek, "Ava you just made my day sweetie. I love you and your silly brother so much." Aaron was crawling around at Sidney's feet so he pick him up, "OK dude your sister is walking now you need to move it along too" joked Sidney as he kiss his son's cheek. Carrie smiled at her boys and realized how lucky she was with this amazing family she had. Sidney looked at Carrie and kissed her, "I love you". Everyone else was starting to arrive and then all the craziness of the day began. The day started off with a lunch with everyone then the dress rehearsal, which went off without a hitch. Finally it was dinner time and everyone met at a local seafood restaurant. The guests were all hanging around and talking but everyone wondered where were Sidney and Carrie. "They knew what time we were meeting so what's the deal?" asked Troy as he looked at Trina. "I don't know" Trina said as she pulled out her cell phone and tried to call Sidney, "He is not answering. It goes straight to voice mail". "Hmmmm its not like them to be late" said Craig trying to call Carrie's cell phone, "It's ringing. Hey Carrie where are you? Everyone's worried." "Sorry Craig. Sidney wanted to walk to the restaurant and we are just now at the door. See ya in a minute" Carrie explained. Sidney and Carrie arrived and everyone was breathing a sigh of relief. "We have been worried about you two" said Trina as she hugged Carrie. "Sorry I just wanted a little alone time with Carrie before it gets crazy" Sidney apologized as he hugged his mom. "Ok well we are glad you two are here so let's get this party started" joked Craig. The rehearsal dinner was fun and everyone enjoyed themselves tremendously. It really was a fun party. After wards the guys were off to a local bar to do bachelor party stuff and the girls were headed to the hotel where they were going to have a girlie sleepover party. Sidney grabbed Carrie's hands walked away for a few minutes alone before they both were going to be rushed off to hang out with their friends. "Hey I just wanted to tell you, that I love you, Carrie Addison. I can't wait until tomorrow when you become my wife" Sidney said as he looked into her eyes. 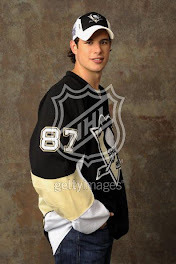 "I love you too Sidney Crosby and I can't wait until you are my husband" Carrie said as she looked into his eyes. "Have fun with the girls and don't do anything I would not do" joked Sidney. "You better behave yourself and don't get into any trouble. Remember what happened to Jordan and Eric Staal before Eric's wedding!" Carrie said sternly. "Don't worry about me, Carrie. I am going to be very careful because I don't need anything stupid and I plan on staying sober" Sidney said very seriously. "I trust you completely, Sidney." "I trust you too, Carrie." Then Sidney leaned down and kissed Carrie deeply. They were being yelled at by their friends to save it for the honeymoon. Before they knew they were both being dragged away from each other. The girls had a two rooms with all sorts of girlie sleepover games. They gave each other make overs and did each others hair and there was a little bit of drinking but nothing to over the top. They gossiped, and danced around the room and had a blast. Finally they all were exhausted and got ready for bed by 2 o'clock in the morning. The guys had lots of drinking at the bar but Sidney did pretty good about trying to stay sober but he was slightly tipsy when the night was over. The guys were all staying at the house and they all passed out pretty quickly when they got home for the night. The next morning the girls were all getting ready for Carrie's wedding. Carrie could not believe that she was actually getting married finally but it was happening and in a few hours she would be Mrs. Sidney Crosby. That thought made Carrie smile as she got ready. At one point her cell phone rang and Vero picked it up. "Hey you aren't Carrie. Who is this?" asked Sidney. "Its Vero and if you hold on a second I will get your future wife for you" Vero said as she went to find Carrie who was sitting out on the balcony of one of the rooms. "Hey Carrie, its Sidney on the phone" Vero said as she handed Carrie's cell phone to her. "Thanks Vero." Carrie said as she took the phone, "Good Morning Sidney." "Good Morning soon to be Mrs. Crosby. I just wanted to say good morning to you and hope that you had fun last night with the girls." "I had a great time. We did all sorts of silly girlie things but I enjoyed myself and I got plenty of sleep so I am especially ready for today. Did you have a fun time with the guys?" Carrie exclaimed. "Yeah I had fun and I hate to say it but I was not able to stay sober because the guys kept handing me drinks but I did get a good nights sleep too and am ready for today too" Sidney said. "I am glad and I can't wait to see you at the end of the aisle in a few short hours" Carrie said. "I can't wait to see you too. I love you" Sidney said smiling to himself. "I love you too. And Vero is standing at the door motioning for me to get ready so I gotta go but I will see you very soon" Carrie said. "See you soon doll face" Sidney said as they both hung up their phones and both went to get ready for the wedding.